Great Ideas for Family Fun While Visiting Ludington! Ludington is one of Michigan's top vacation destinations, and it's no secret why! Hundreds of families head to Ludington for the countless number of activities, sure to please adults and kids alike. Kids can be entertained for hours with a day at the beach, and Ludington has miles of clean, safe beaches where you'll never feel crowded. Stearns Park Beach, right at the end of Ludington Avenue, is a popular choice, and features a playground, restrooms, concessions, mini golf, shuffleboard, and the Ludington Skate Plaza. Hamlin Lake is bordered on the west by the Ludington State Park and on the east by multiple resorts that offer cabins and cottages for families and large groups. Pontoon, fishing, and speed boats are available for rent, and the State Park also has canoes, kayaks, and paddleboats for a great day on the water. Waterfront Park in downtown Ludington is a wonderful place for families to spend time. 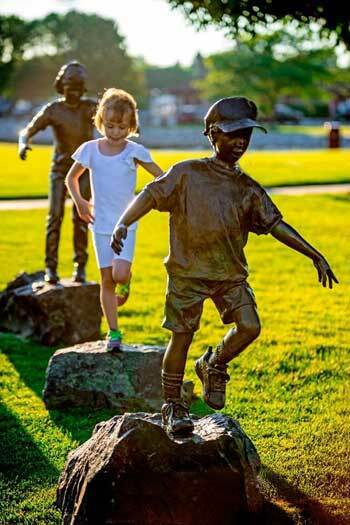 You'll find a nice, safe playground, scenic walkways with benches, restrooms, and nine bronzed sculptures that each tells their own story. Golf is a great family activity, and Ludington has all varieties here--2 public golf courses, 3 mini golf locations, and six disc golf courses. About 20 minutes south of Ludington are the Silver Lake Sand Dunes. Here you can take a guided jeep tour across the rolling terrain. Or drive yourself, but with caution, as these are shifting sand dunes and constantly changing. The Little Sable Point Lighthouse is located within the Silver Lake State Park, and completes your lighthouse tour from "point to point." Did someone say Mini Golf? The Ludington Area Jaycees Mini Golf Course at Stearns Park is newly renovated with a "Landmarks of Ludington" theme and profits from the course are donated back to community enrichment organizations and programs! Click here to get some great ideas for fun family farm activities! Sandcastles Children's Museum is a wonderful place to bring kids during the summer months. Have fun at Messy Mondays and Fun Fridays, along with a Climbing Wall, an actual Cessna 172 and Construction Zone. They're open every day for the summer season from May-August. 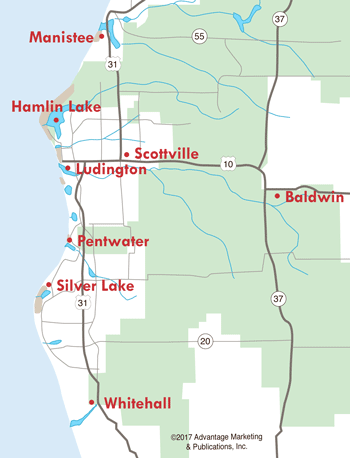 South of Ludington and along Lakeshore Drive is Historic White Pine Village, set on 23 acres overlooking Lake Michigan. It depicts life as it was in the early 1900s with historic buildings and artifacts to explore. Within the Village you'll find a gift shop and an old-fashioned ice cream parlor, along with 29 historic buildings. The Mason County District Library has embraced children with its wide array of summer programs, designed to entertain and teach. 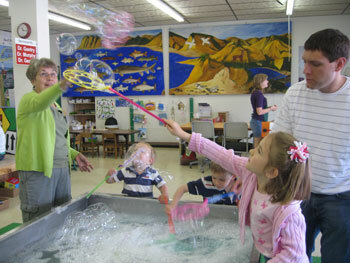 They offer Crafts for Kids, Summer Reading Program, Story Times, Magic Shows, and a Mobile Planetarium. The library celebrates the holidays with parties at Halloween, Christmas, and Valentine's Day. The local movie theater offers eight different movies to choose from, and Ludington also has a Family Video for your movie rental needs. McDonald's and Burger King also have indoor playlands, always popular with the little ones. You don't have to break the bank to have a great time with your kids in Ludington. Between free music, festivals, and other vents, there's great fun to be had "on the cheap" here! Summer is filled with free concerts of many genres, from jazz to Christian to the wildly outrageous Scottville Clown Band! The annual Rhythm & Dunes Concerts at Waterfront Park features great music in a beautiful setting. 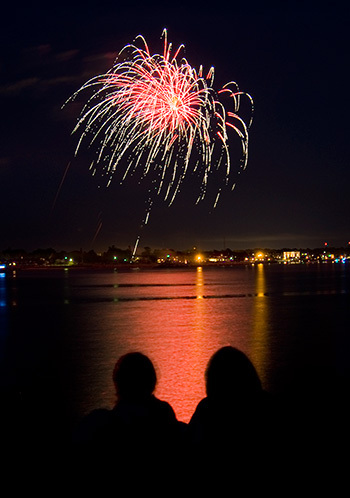 Other summertime activities are Friday Night Live, Movies in the Park, Sunset Bonfires, the Ludington Area Jaycees 4th of July Freedom Festival, and art fairs--all free! Indoors or outdoors, rain or shine, Ludington has the fun you’re looking for to make a memorable family vacation!